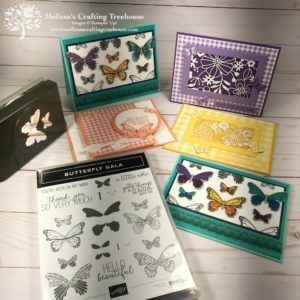 Today’s post is all about finding creative inspiration from images in the world, to use in your card making. This was the swap theme for my team gathering and it was one of my all time favorite swaps! The best part was getting to know each of my team members just a bit better through their stories and seeing what inspired them! 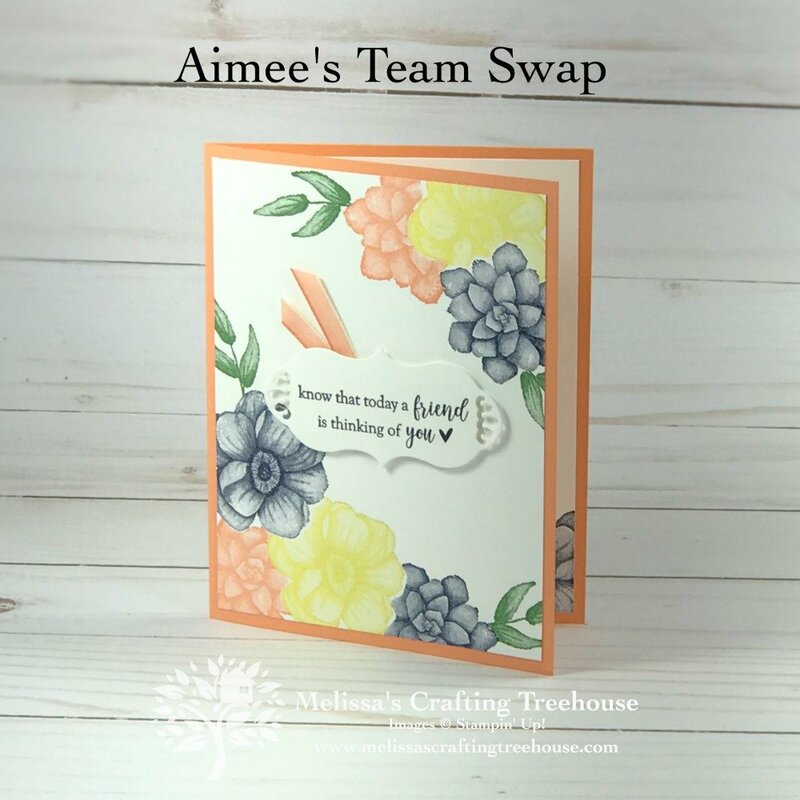 Aimee’s card was inspired by the cover of a journal. 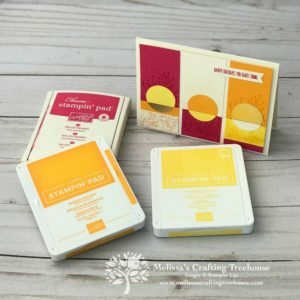 She used the Painted Seasons Stamp Set. 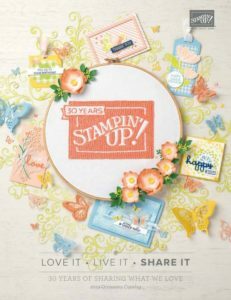 This stamp set is part of a bundle that is available as a FREE item during Sale-A-Bration! Can you see that she masked her flowers to give the images a realistic, multidimensional look? She did such a beautiful job! 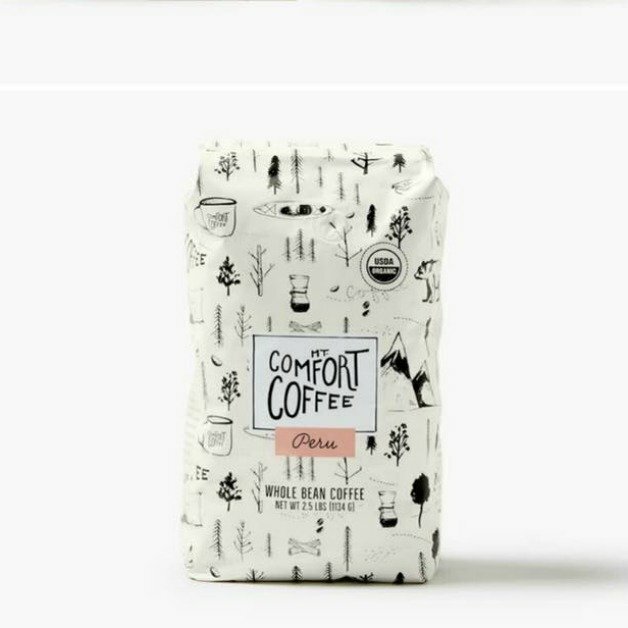 The creative inspiration for Mary’s card was some product packaging, specifically a bag of coffee! I like how she chose to add a little pop of color! 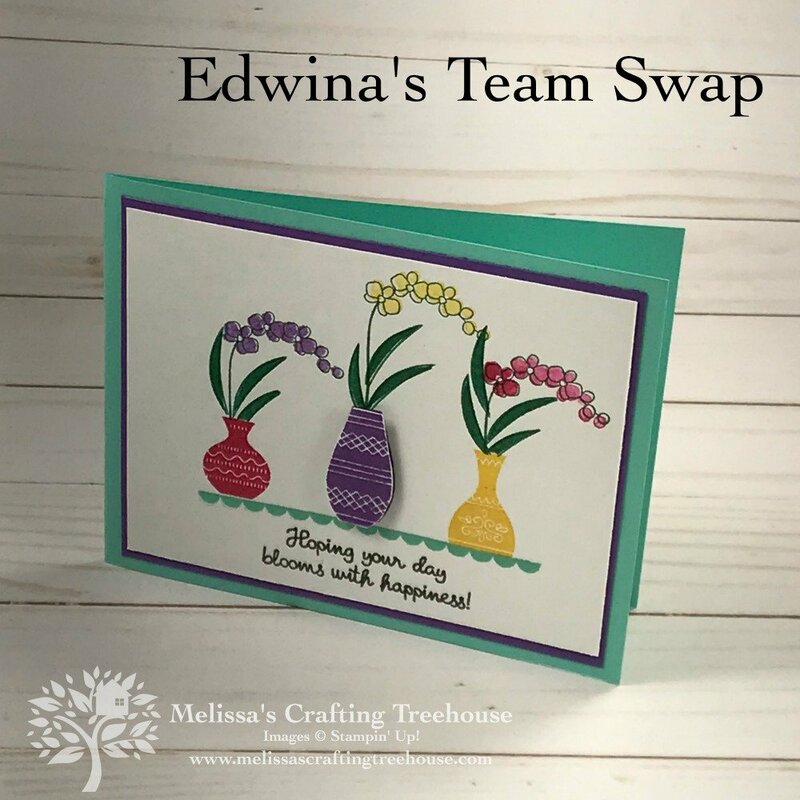 Edwina’s card was inspired by the gorgeous orchids she grows! 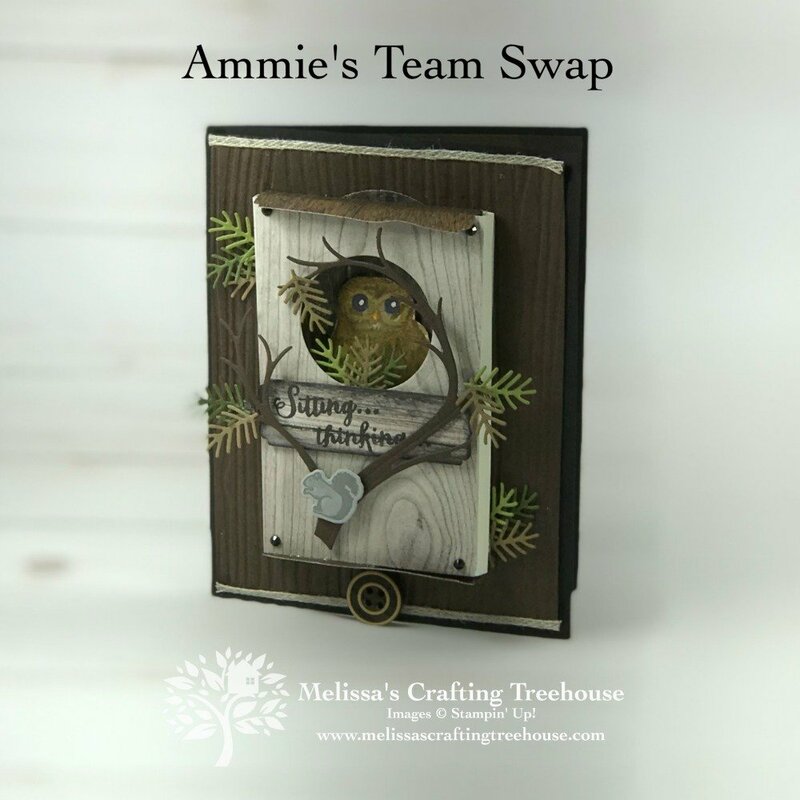 Ammie’s card was inspired by the owls in her backyard! She told us the funniest story of how her and her husband learned how to “speak” to the owls in their backyard. 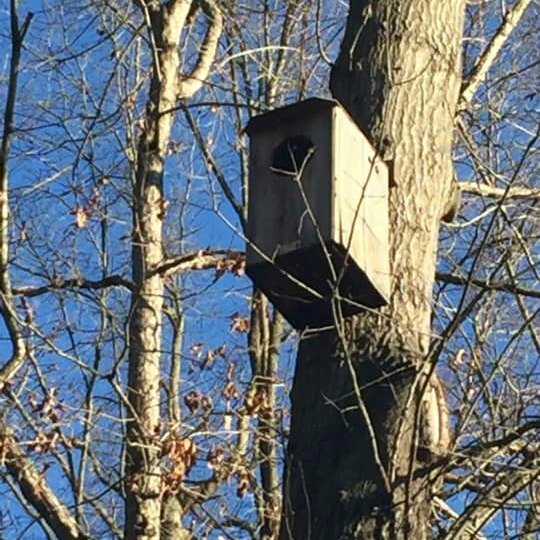 They got an owl house to help keep them around. Check out all the amazing detail in her card! 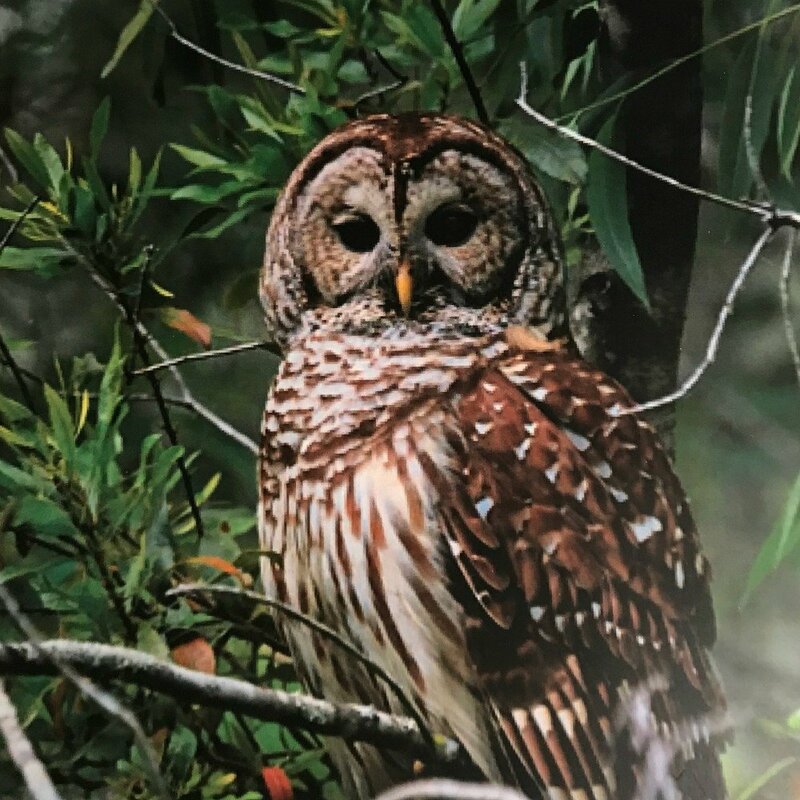 … and a beautiful owl too! 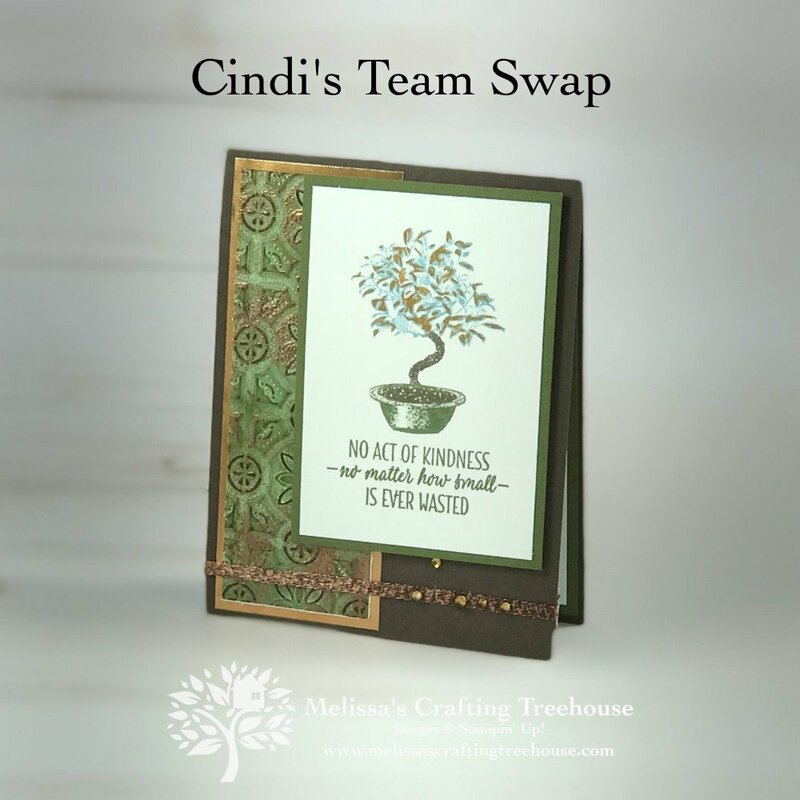 Wanda’s swap was actually inspired by a card she saw on Pinterest. 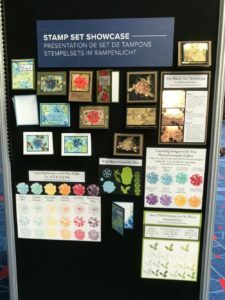 This was a bit of a challenging swap theme so team members were given the option to find creative inspiration wherever they could find it, as needed. 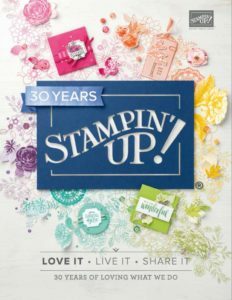 Wanda makes beautiful cards and this is no exception. 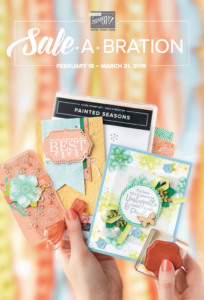 She used the Painted Seasons Stamp Set and Designer Paper which is available as a bundle FREE during Sale-A-Bration. Plus, she also used the coordinating Four Seasons Framelits Dies. 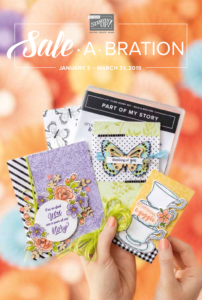 All of these products are available only through 3/31/19 or while supplies last! 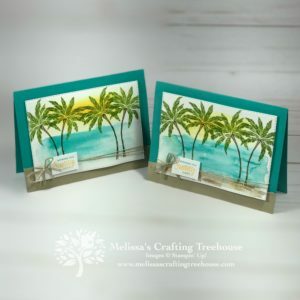 The creative inspiration for Barb’s card was a place in the mountains that she and her husband love! Here’s her inspiration. Isn’t this an amazingly beautiful photo? 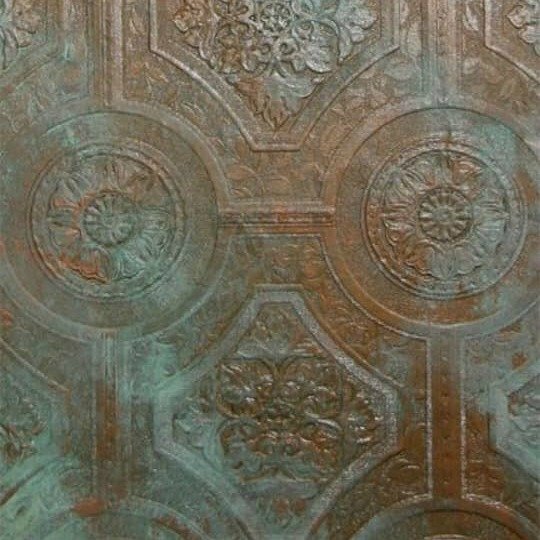 Cindi’s card was inspired by a metal patina look that she loves! 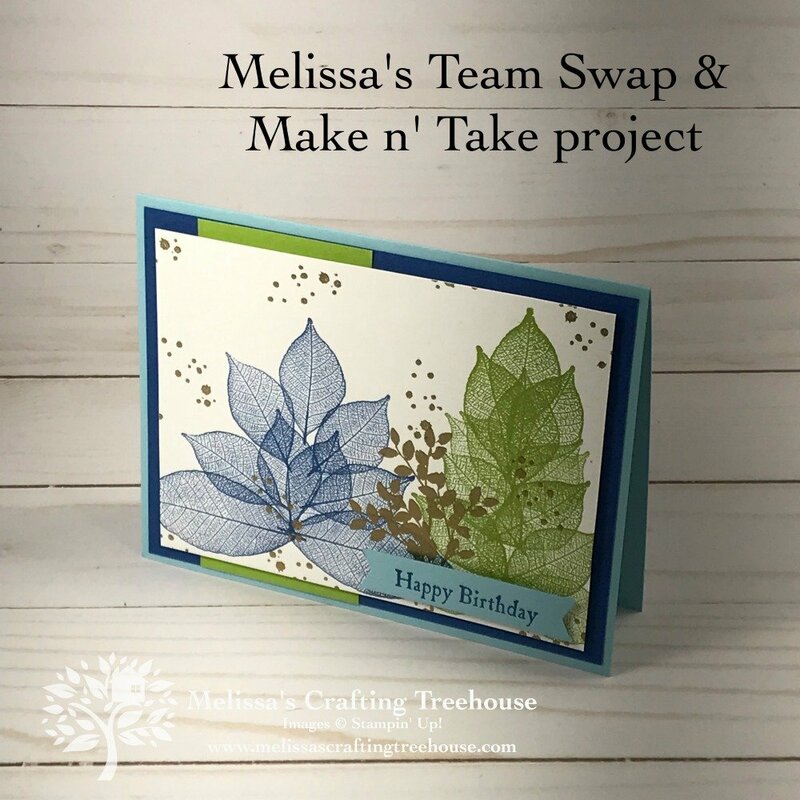 This next card was one of the Make n’ Takes for the team meeting which also doubled as my swap card. 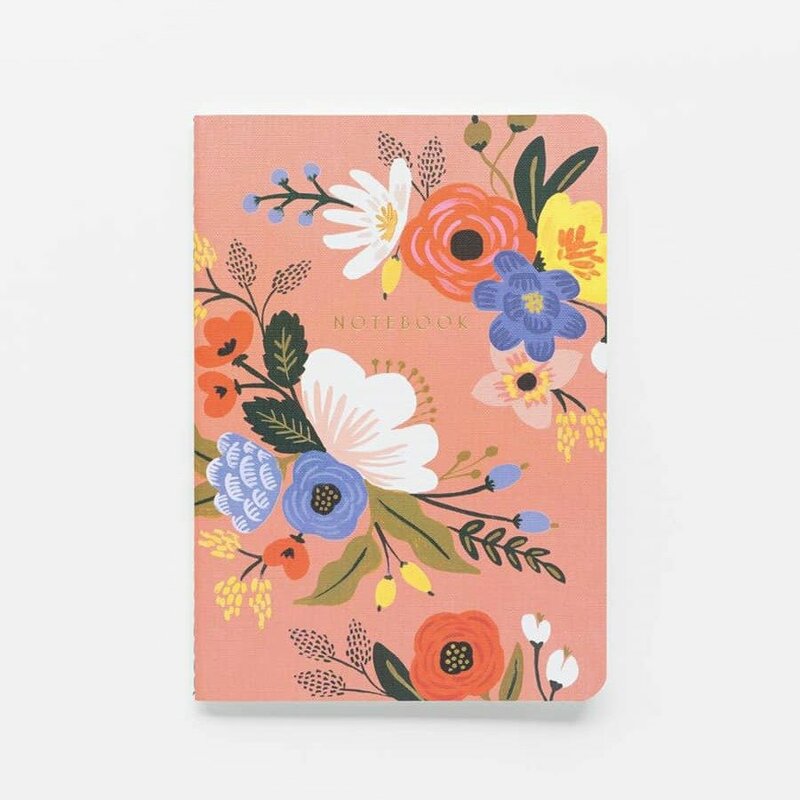 I picked a particularly difficult source for my creative inspiration and I wasn’t sure even how to approach my design. The fact that I actually created something makes me especially proud because it was so hard. When you see my source of creative inspiration, I think you’ll understand what I mean. I took the photo below while I was in Orlando FL this past November for OnStage Live. Aimee, Melissa (two team members) and I, went to the Magic Kingdom for some fun on our last evening there. 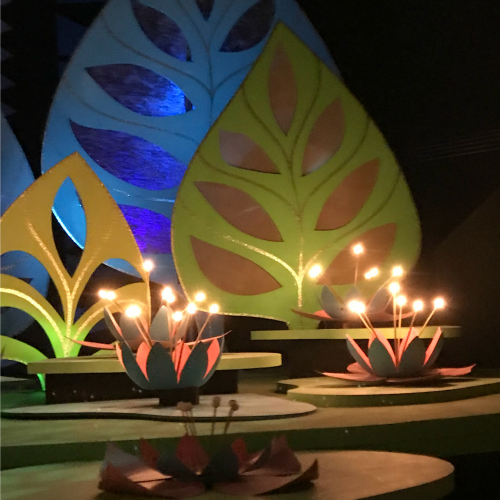 We went on the “It’s a Small World” Ride, which is where this photo was taken. 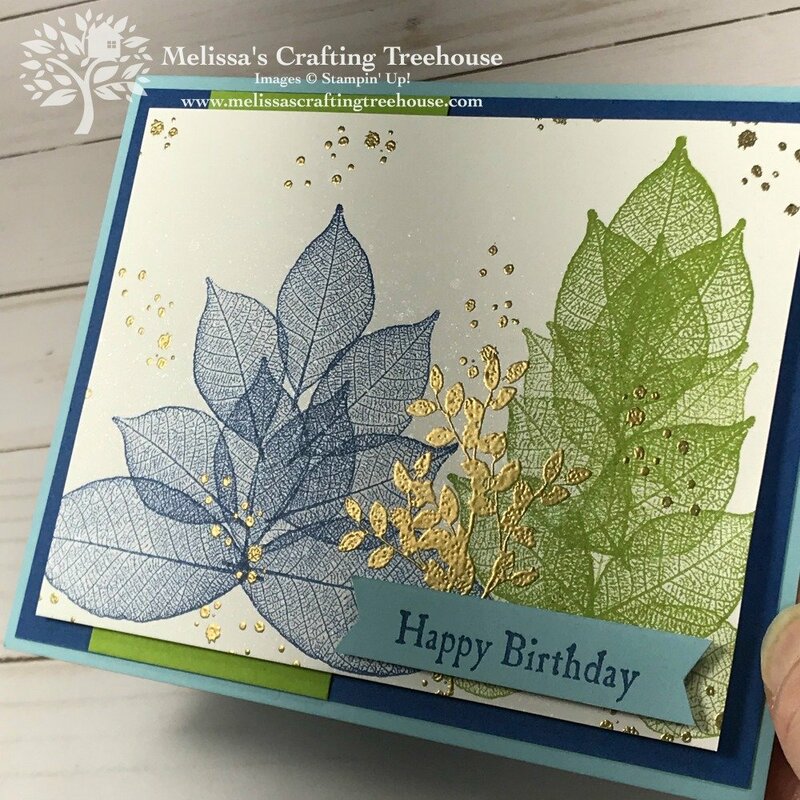 I just loved the shapes, colors and light and immediately thought it could be fun inspiration for a card! As I said, it was quite challenging to design a card based on this photo. You can probably see that I attempted to mimic the shapes, some of the colors and added some sparkle and bling to capture a bit of the light. 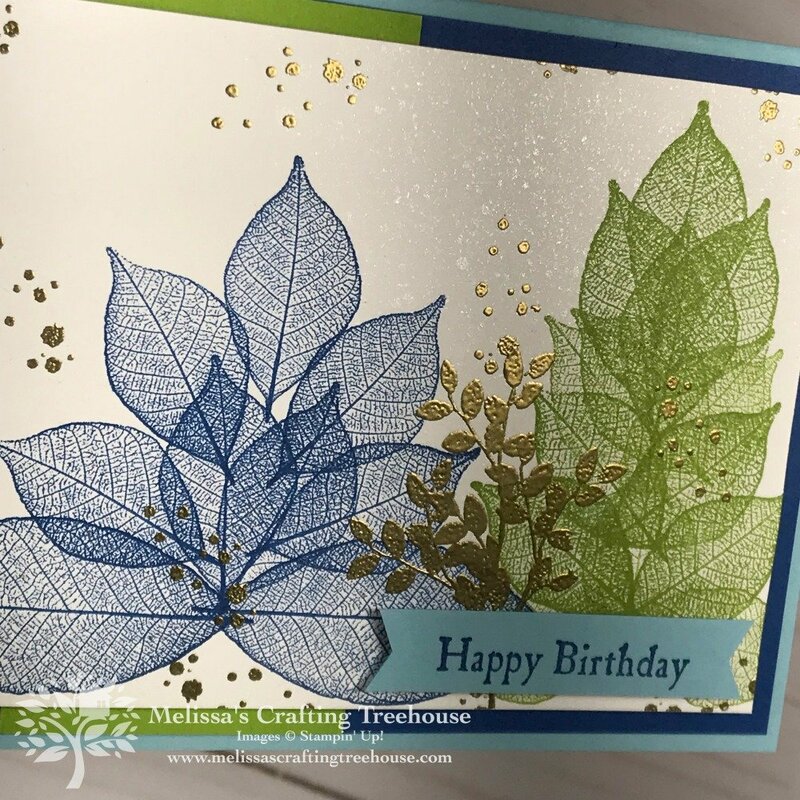 I used the Rooted In Nature Stamp Set and an image from the Timeless Textures Stamp Set for my card. I essentially used the two leaf images to build the larger leaf shape as I saw it in the photo. The other element I loved about the photo was the splashes of light and the shimmer in the large blue leaf. 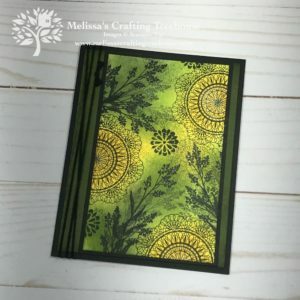 With that in mind, I heat embossed the sprig of leaves a few times with gold embossing powder, plus added spots of gold embossing here and there. Finally, for some added shimmer and shine, I made shimmer spray using some Frost White Shimmer Paint diluted in alcohol. I sprayed the whole focal piece as you may be able to see in the close up above. So this was one of the two Make n’ Takes at our team gathering. 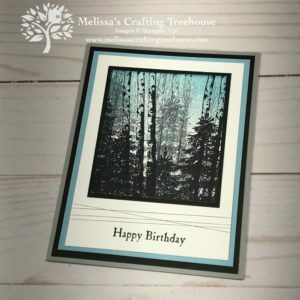 The second design was a simple card made with the Wood Textures designer series paper and the Winter Woods Stamp Set. I actually demonstrated this project in a Facebook Live some weeks back. Click HERE to check out that video. 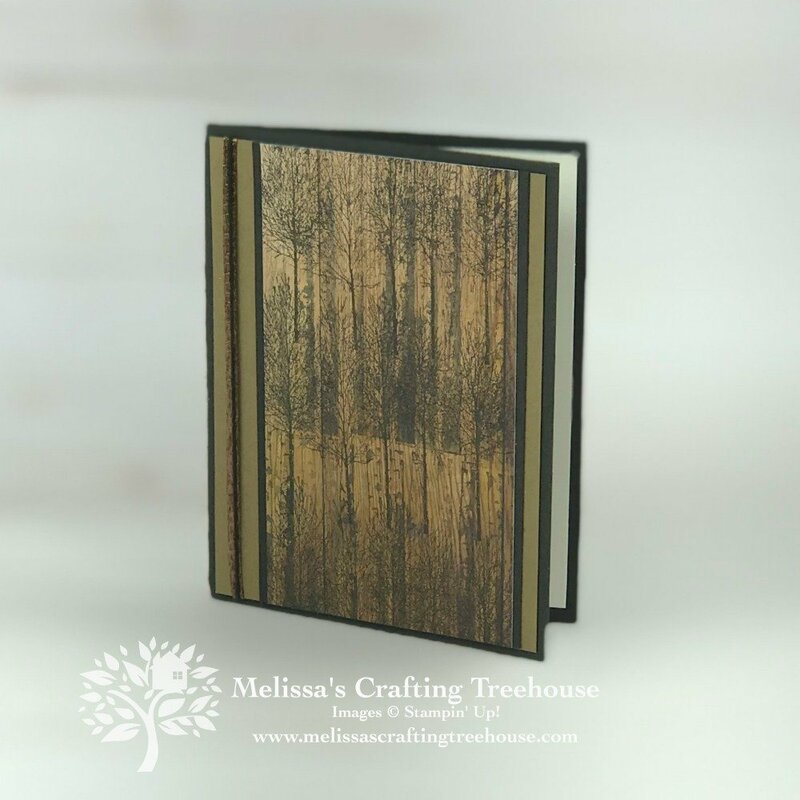 Click HERE to find dimensions and a supply list on my blog post for this project. Here’s the full set of cards again. 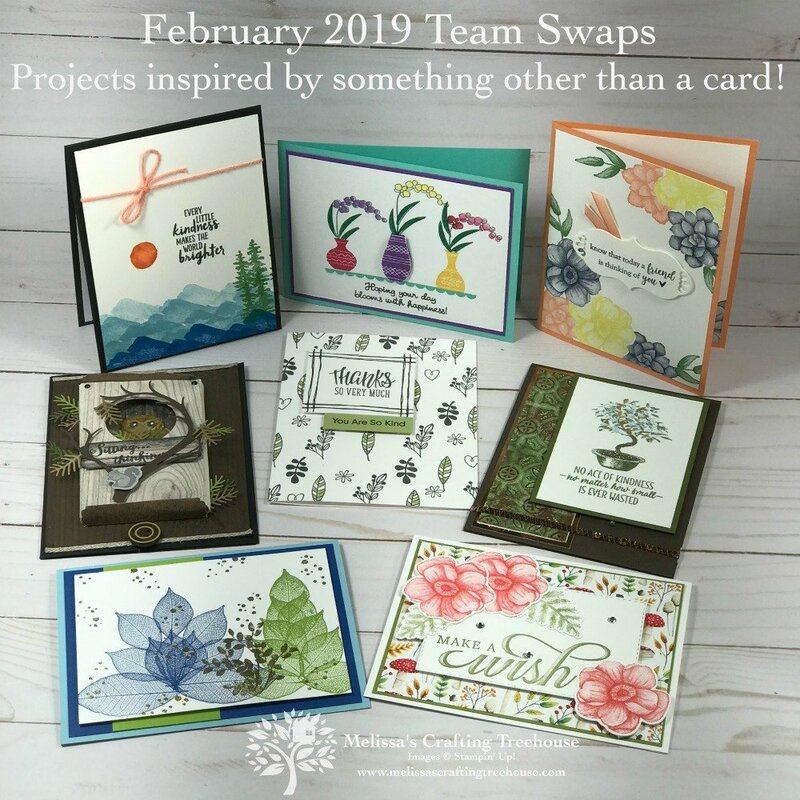 I hope you loved seeing these team swaps with the creative inspiration for each one. It makes me so proud of my team! They are such an incredibly creative group! This was a bit of a hard challenge and pretty much everyone took it on and did an awesome job! 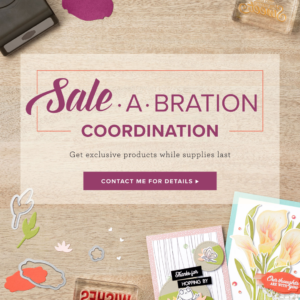 To learn more about joining my team of Treehouse Chicks click HERE. 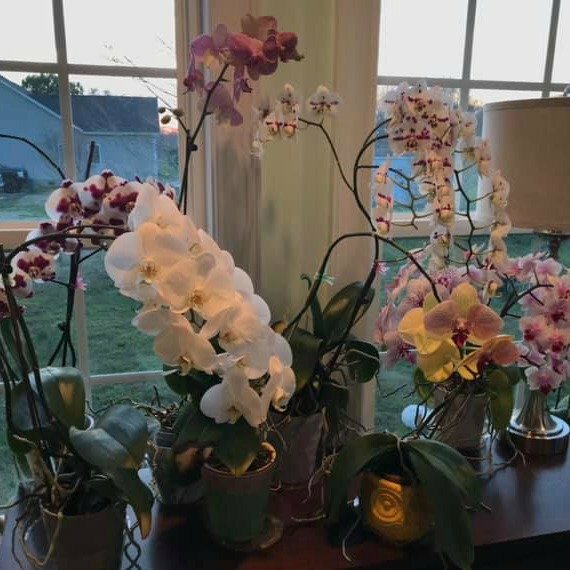 I’d love to have you join in on the fun! 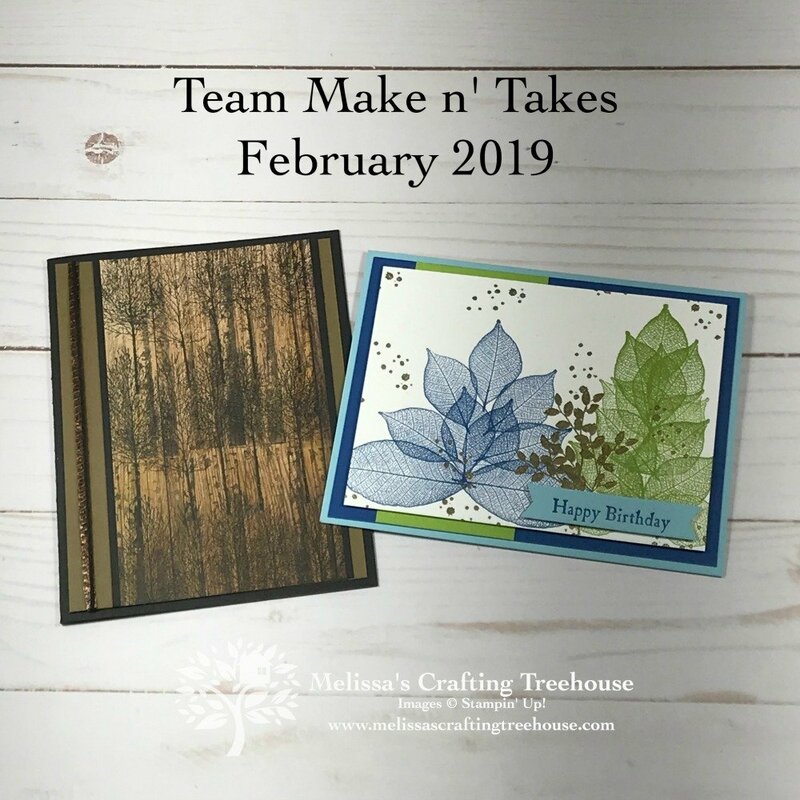 You’ll find project dimensions for my second team Make n’ Take and a complete supply list at the end of this post in case you’d like to recreate these cardmaking ideas or purchase any of the products. 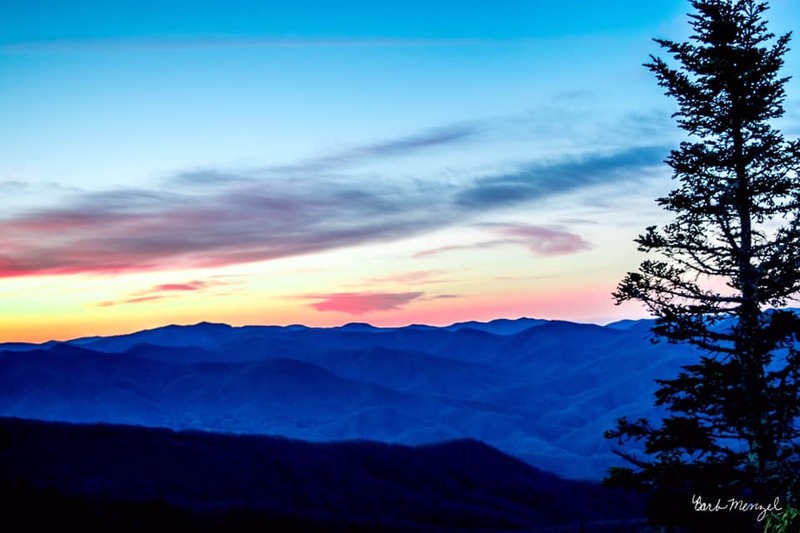 Join me for my next Facebook Live Event on Thursday 3/21/19 at 7 pm EST – YES! THE TIME of this EVENT HAS CHANGED!!! The dimensions below are for the card made for this months challenge only.